Description: Red Feather Ranch - A UNSC combat training site found deep in the Colorado mountains. Red Feather Ranch- located in the former United States, (specifically the Colorado State area) this forest area has been used for USNC training since its discovery in 2373. Some architextural features and large holes in the stone structures suggest that they were used as a staging ground for some sort of battle. While the origin and purpose of the structures is unknown, they are made of gargantuan pieces of greek marble, dated back to pre-historic times- it is unknown how the slabs were transported to Colorado. A shaft consisting of 7 chambers connected by ladders runs through the site, and can be used as an alternate route from one base area to the other. ~Actually, the shape of the land is based on a real place I lived in Colorado. I have started over 3 or 4 times over the last year and a half in trying to get it right, and this is as close as I can come without topographical maps and a helicopter. :P It's fun for assault and all types of slayer and king, but could be unbalanced for classic ctf, though it has been slightly balanced out with placement of vehicles, weapons, etc. A note: This map has a LOT of trees- I optimized it as much as possible, but those of you with slow video cards will NOT have very much fun with this map due to low fps- I have a radeon 9600 pro and it runs at about 35 fps with everything on high, which is sufficient for me personally, but very competitive players might be put off by some choppiness in some areas, especially while driving a warthog. Please don't be offended if you have a crap card- and yes, it is portaled- I tried to make it as fast as possible while still maintaining a very high number of trees, and I had to come to a happy medium, which I think I did. Also thanks a lot to Kornman00 aka another hobo for the new HEK and animation tool! Thanks to killa for helping me with the hud stuff and my animations! 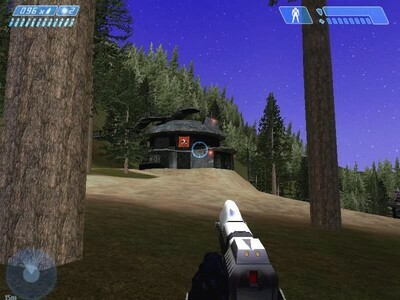 Thanks BUNGiE and Gearbox for giving us Halo CE! !